Imagine a city in 16th century West Africa where thousands of Native African students pondered over the latest ideas in science, mathematics, and medicine. A fabled town in the middle of the scorching desert, overflowing with countless numbers of valuable books, expensive crafts, exquisite fabrics, and unrivaled gold jewelry! Imagine a community of highly cultured, wealthy people whose forbidden streets were the subject of legends and whose ochre walls were sought after by some of the greatest adventurers of the times. 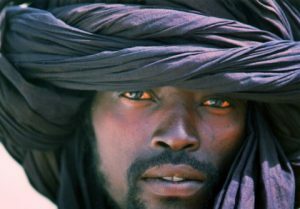 For most people, this notion is as remote as saying, “I’m going to Timbuktu!” Yet West African people and the Berbers of the Sahara desert knew such a place and took pride in being connected to it in any way possible. Timbuktu in the sixteenth century was all of this and more! Its fabled streets were the home of one of the most respected universities in the world and its intellectuals reached the pinnacle of earthly scholarship and spiritual development. 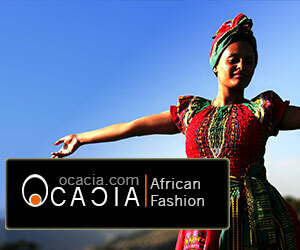 Its commercial networks stretched from below the Niger River to the Mediterranean Sea, and from the Atlantic Ocean to the Arabian Peninsula. Timbuktu was the most famous meeting place of the camel and the canoe, where the highest grade gold was exchanged for salt, cloth and other essential items. How did this fabulous city of commerce and scholarship appear on the shores of the Sahara desert? What became of its wealth of knowledge and material goods? A journey into present day Timbuktu may very well reveal some of the answers. The story begins with a Tuareg client woman named Buktu who founded a settlement in the 11th century, some 12 kilometers (eight miles) north of the Niger River flood-plain along the southern edge of the Sahara. It was a perfect resting place for the nomadic Tuareg Imashagen who roamed the desert in the rainy season and were in need of a malaria-free base for their animals to graze during the scorching heat of the summer. Buktu’s camp had fresh water wells, and she would protect their heavy goods when they left the camp at the first rains. This small, seemingly insignificant campsite, known as “Tin-Buktu” or the well of Buktu became the cornerstone of a thriving, bustling city. In 1325, Mansa Musa, the ruler of the vast empire of Mali returned from his fabled pilgrimage to Makkah. He had crossed the desert with over 60,000 followers. His caravan contained eight thousand soldiers, servants and courtiers who drove 15,000 camels laden with gold, salt, perfumes, and stores of food supplies. It is said that the Mansa carried so much gold with him (approximately 180,000 kilograms) that he changed the economy of every land that he reached. On his return, Mansa Musa built a masjid at every stop and on reaching Timbuktu, he commissioned his chief architect, the Andalusian Abu Ishaq As-Saheli, to build the largest house of worship in the whole of West Africa and a spacious royal palace. The grand masjid called Jingarey Ber or Al-Masjid Al-Kabir is still standing and has been the primary site for Friday prayers in Timbuktu since that time! Mansa Musa’s exploits made Mali and Timbuktu world famous and legends of gold-lined houses and fabulous riches were spread throughout Europe. At the height of the city’s golden age in the 16th century, Timbuktu boasted over 150 schools and a major University at the Sankore Mosque that enrolled over 25, 000 students! The curricula were intensive and included the Islamic sciences like Qu’rannic interpretation (Tafseer), The Prophetic Sayings (Hadeeth), Islamic Jurisprudence (Fiqh), Sources of Islamic law (Usool), and Islamic doctrinal theology (Aqeedah). This formed the core of the syllabus. Besides this, students were required to memorize the entire Qur’an and the famous Texts (mutoon) and gain mastery over the Arabic language through the study of grammar (Nahw), literary style and rhetoric (Balaagah), Arabic poetry and logic (Mantiq). After mastering the basic texts and memorizing the required material, the student was assigned a mentor who specialized in a particular field of study. The relationship of student and the master often grew to the point where the student would work for the master or become part of his family. This Mulaazamah system produced scholars who not only benefited from their teacher’s theoretical knowledge but internalized his lifestyle and understood his deeper concepts. Timbuktu’s history has come to us from a series of historical works or Tarikhs written from the mid 17th century through the 18th century. These well written Arabic treasures enable us to enter the African world of scholarship and deep intellectual thought. Some of them were bound with beautiful leather binding and have stood the test of time. The most famous chronicle in this period was the Tarikh-as-Sudan, or the History of the Sudan, written in 1653 by Timbuktu’s most illustrious historian ‘Abd ar-Rahman as-Sa’di. It gives a detailed exposition of the history of the city from its founding till the time of the writing. The two Tarikhs that support Tarikh as-Sudan are Tarikh al-Fattash by Mahmoud Al Ka’ti and the anonymous Tadhkirat an-Nisyaan or A Reminder to the Oblivious. The two latter chronicles remind us of the glorious past and lament the decline of the city. Today, many of these great works have been unearthed from private collections and stored in documentation centers. The most famous is the Ahmad Baba Center for Documentation which began its collection around 1970 through a UNESCO educational grant. 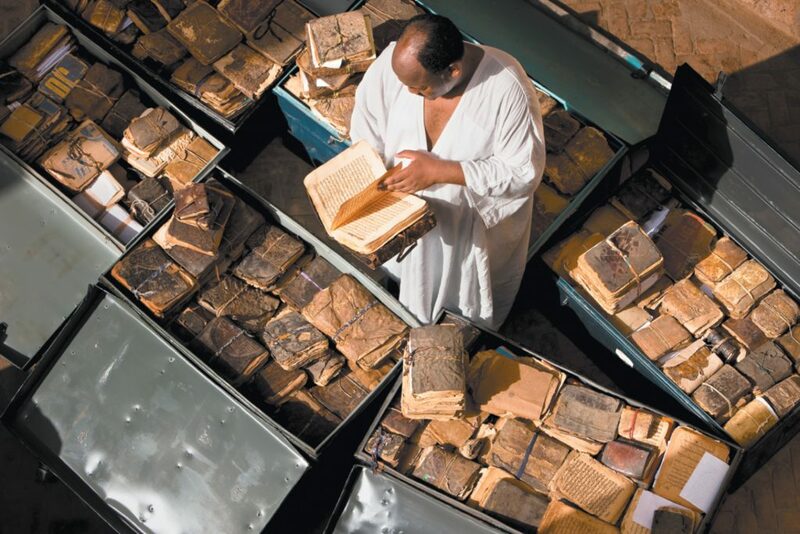 Named after one of the greatest scholars in Timbuktu history, this center has been chosen by President Thabo Mbeki of South Africa as the focus of a major drive to preserve the manuscripts of Timbuktu and train Malians in modern art of archival science. Mr. Mbeki visited Timbuktu in 2001 on a diplomatic mission and was so impressed by the thousands of manuscripts written by African scholars that he made this project one of the chief endeavors of the African Union. In addition to the Ahmad Baba Center, the Bibliotheque des Manuscrits “Al Wangary” houses the private library of the family of Shaykh Muhammad Bagayogo, the teacher of Ahmad Baba. The Mahmoud Ka’ti Collection contains numerous rare manuscripts from the great scribe’s personal collection. The Mamma Haidara Memorial Library has brought together a host of important documents and has sent displays around the world. The As-Sayouti collection contains some of most beautiful handwritten Qur’ans in West Africa. 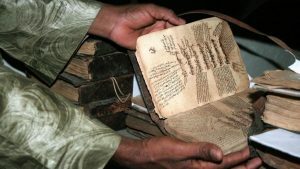 So much work has been done in bringing together the written history of Timbuktu, that a network of 23 private collections has been formed to give local direction to this sensitive task. 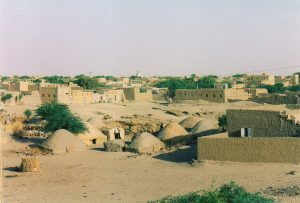 Timbuktu’s skyline has always been dominated by its houses of worship. It is to the famous mosques that the old city with its triangular layout owes its different quarters. These adobe mosques have become famous throughout the world for their unique shapes and their long histories. In the northern quarter, at the apex of the triangle lies the Sankore Masjid with its pyramid shaped minaret laced with protruding wooden support beams. It was here that the Sankore University housed its thousands of students and produced some of the greatest scholars in Africa. In the western corner of the city lies the Jingerey Ber Masjid built by Mansa Musa in 1325. Five hundred years later in 1858, the British traveler Henry Barth wrote that the mosque “by its stately appearance made a deep impression on my mind.” This masjid is now considered the oldest standing mosque in West Africa and it has hosted the main Imam of Timbuktu at the only Jumu’ah Prayer (Friday Prayer) in the city since its inception. 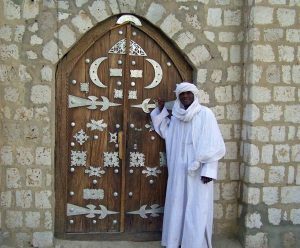 In times of crisis, it stood as a sanctuary for the people of Timbuktu and a center for deep spiritual reflection. The third major masjid is the Sidi Yahyia Masjid that was originally built by Shaykh Ibrahim Hamallah Al Kunti in the 14th century and rebuilt about 1400 by Amir Muhammad Naddi. It is the best preserved of the main houses of worship and along with the other two is a world heritage site. 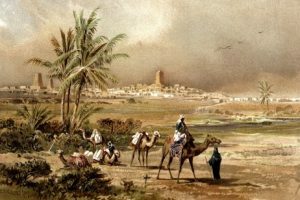 The first non-Muslim to enter the city on April 20, 1828 was the French explorer Rene Caille who was disappointed at the state of the buildings of Timbuktu but noted that “apparently all of the population could read the Qur’an and even know it by heart.” The golden age had passed but the spirit of scholarship and piety still remained. Timbuktu with its thousands of manuscripts and its deep legacy destroys racist notions of Black inferiority and educational backwardness. Timbuktu gives solid proof of a powerful African past and an unbroken chain of African scholarship. Timbuktu also brings out Islam’s great legacy of development in Africa and its proper place in the annals of African achievement. It’s well preserved lessons of spirituality and peace making may very well hold some of the answers to today’s complex problems of war and never ending conflict. Maybe the heat of the desert sands and the emptiness of its expanse can provide direction for the African Renaissance and even the whole human race. 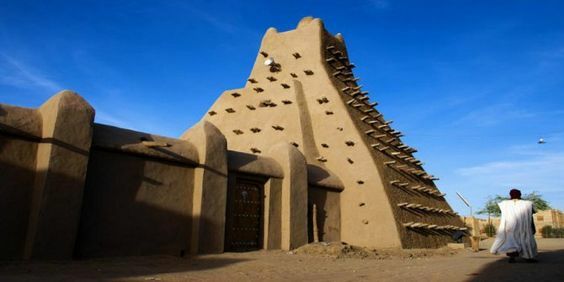 Timbuktu has been designated by the African Union as one of the most important African heritage sites and has become a special building initiative of the government of South Africa. Timbuktu’s legacy refutes the racist notion of African inferiority and inability to record information. The knowledge of this history will also become a valuable tool for the Daa-íyyah who is calling to Allah in the Southern African Renaissance of economic, cultural and political liberation. According to ‘Ali Ould Sidi and many historians of the region.